This year I didn’t take my own advice and have pots of Daffs that are stunted and unlikely to excel. Take the plunge and bury your bulb pots to encourage strong root growth. Next year is the key- at least gardeners usually get another chance to fail! 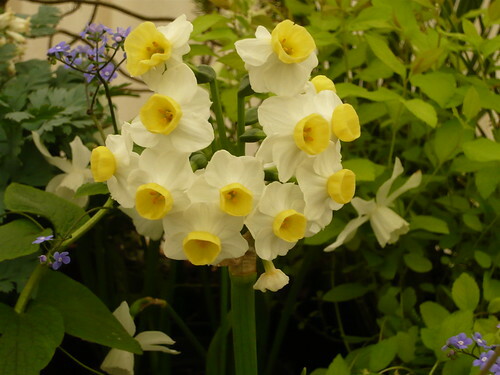 If you grow daffodils in pots you will get better results if you ‘Plunge Pots’ in soil or peat after potting. 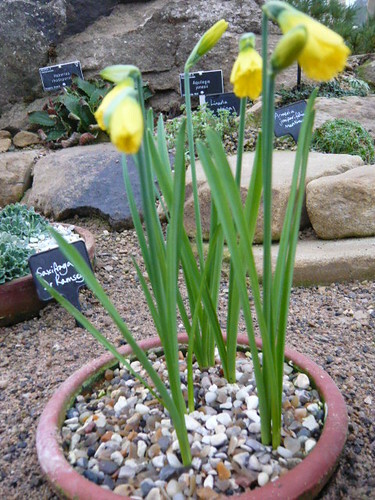 Daffodil bulbs do not like to be frozen so you need to plunge or bury the pot at least 2 and preferably 4 inches deep. Leave them covered for 16-18 weeks. Feed with high potash feed every week during and after flowering to build up the bulbs for next season. Do not cut the leaves but when they have died back gently pull them from the base. Take the plunge and bury your bulb pots. This evens out the ground/compost temperature for the bulbs to grow good roots and develop in a natural manner. Miniature daffodil bulbs like this treatment. If you want to regrow the bulbs next year give them a bit more room and plenty of root depth.